Pyramyd Airsoft Blog: Let's have a piston-measuring contest. Clearing the air surrounding the mysterious CA25 gearbox. 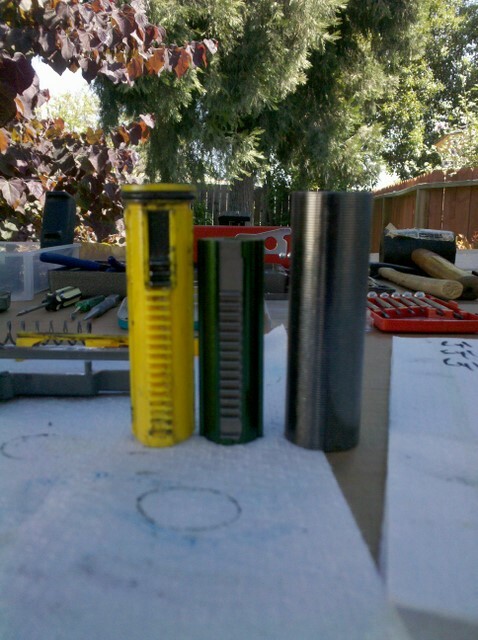 Let's have a piston-measuring contest. Clearing the air surrounding the mysterious CA25 gearbox. So, most of you already know this, but I know for a fact that not everyone does. The piston, cylinder and gearbox as a whole in the CA25 AEG is longer than a standard version 2 gearbox. I know, I know. Old news right? Well, yes, but I had a local Airsoft store manager try to tell me at a recent game that I could just use standard-length piston inside my CA25 gearbox. Well, not only is the piston in the CA25 longer, but it also has more teeth. PLUS, with a longer piston, you can expect the cylinder to be longer than a standard cylinder. And since the piston has more teeth, a standard sector gear will not suffice when used inside the CA25 gearbox. The CA25 sector has a few extra teeth than normal. Plus, even if you did find a regular sector gear that fit the CA25 gearbox and used a regular piston, because of that extended cylinder, your standard sector gear will not pull the piston back all the way, leaving a considerable portion of unused air volume within the extended cylinder. So in terms of energy transfer, you've created a serious inefficiency. If you don't believe me, like that idiot I talked to on the field, check out this photo. Long story short: make sure that if you're going to upgrade your extended version 2 gearbox like the one used in the CA25, you need to make sure you get a piston made for that specific gearbox, as well as gears that are also made with extra teeth to accommodate that extended piston. Don't be an Airsoft idiot. Airsoft idiots don't win. They lose. Have a nice Airsoft day.